10+1 titled sections; preface dated 1664; ci lyrics; first of 5: others are ca. 1802, 1833, 1876 and 1882. 24+1 sections; only here and in ca. 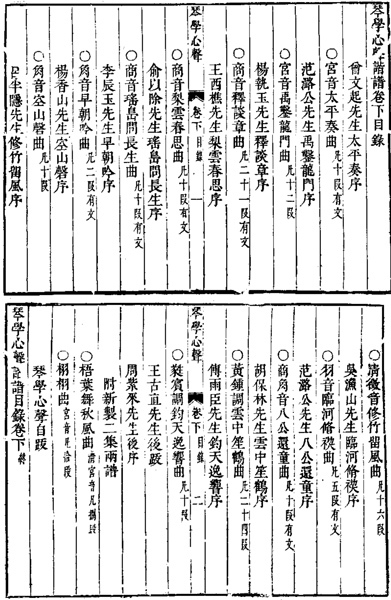 1802; Huangzhong tuning; further details below 5. "The Music of Heaven Unrestrained"? 41132.1 鈞天 1. 九天之一 one of the nine heavens; 2. 音樂名，參見鈞天廣樂 name of a music, see Jun tian guang yue, which Shi Ji called, "The music of heaven." Shouldn't this be after p.164? QQJC XII/60-61. These pages are copied to highlight the fact that the last two pieces seem to have been added separately at the end, qne elsewhere there are references that seem to suggest this handbook had 12 melodies, but all 14 are included here as part of the whole. I have not yet clarified this. This composition by Zhuang Zhenfeng, in Huangzhong mode (lowered first string, raised fifth; 1 3 5 6 1 2 3), survives only from here and >1802. Furthermore, a comment attached to the melody Hujia Shibapai as published in 1820 stated that this Hujia was one of only four melodies using this tuning that was still extant (played? ), the others being Yunzhong Shenghe, Da Ya and Qiu Yue Zhao Maoting. For shenghe 笙鶴 26531.22 says 仙鶴名 the name of an immortal crane. 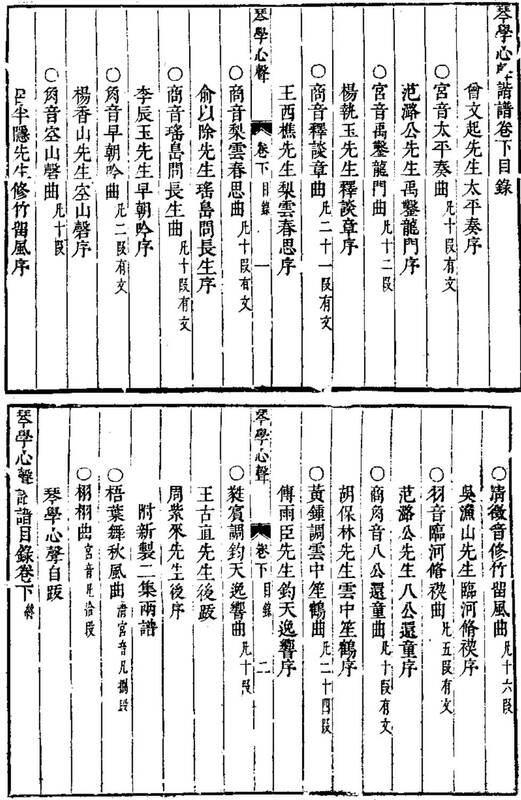 From this one can see that he is credited with having "子著 written" five of the six pieces with no lyrics and having "製 crafted" the sixth. As for the eight pieces with lyrics it is a bit more vague. Only one (#1) is he said to have "written", all the others he "子諧音 arranged" or "edited 子編". Perhaps he did create the music, but perhaps in some cases he was adapting existing melodies.